Breakfast does not always have to be the same if you get my drift, so one morning I thought that I wanted to enjoy some of those fabulous duck eggs that I had just purchased at our fabulous Wood River Sustainability Center (http://wrsustainabilitycenter.com/). I do hope that you all know about this center here in Hailey because it features the most wonderful local produce (and more) for you to buy and enjoy. Pasta has always been one of my favorite foods and though I try to eat it in moderation, I do think that if you have pasta in the morning that’s probably the best time of the day to have it. 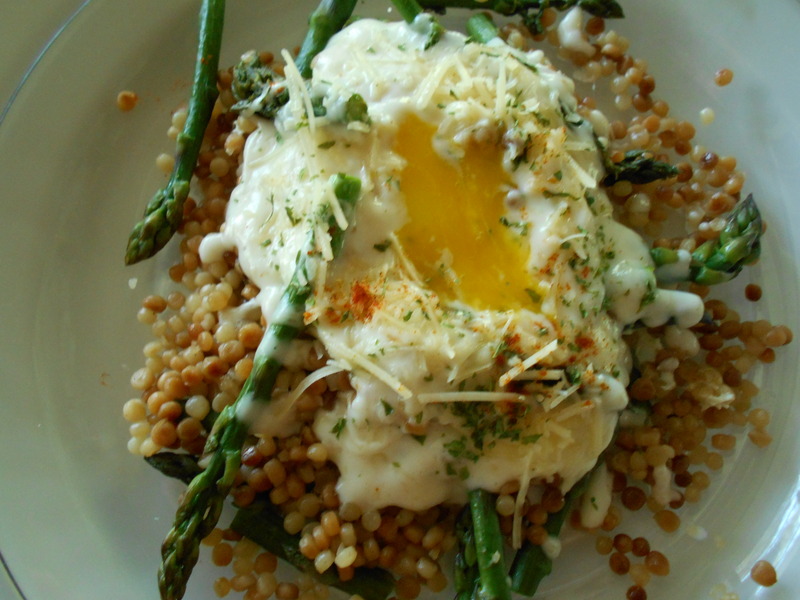 I particularly enjoy the Israel Couscous and so here is a little dish that I created for a little brunch. By the way, if you have any of this left over pasta, you can sauté it quickly in some olive oil and it’ll become quite crunchy and excellent in a different way than you’ve had it in this dish. So, this is the 1, 2, and 3 game plan: make the sauce first, then the asparagus, then the couscous and then put it together. I know, it looks like a lot of work, but really it isn’t—it’s actually a breeze to put together and best of all, it’s very yummy. Also think, you probably won’t make it on a daily basis—but then again, who knows? Melt the butter and the Parmesan in a small saucepan over low heat or in the microwave but DO NOT LET IT BURN. Combine all the other ingredients in a blender and blend first and then drizzle in the butter/parmesan. The sauce will thicken. Taste and add in more whatever you wish. Transfer to a container and keep warm by putting the container in another bowl full of HOT water—stirring every now and then to keep smooth. It should be OK for the next 1/2 hour at least. Easy is the key to this good sauce. In a medium sized skillet, heat 1-2 Tblsp olive oil and add the asparagus, one minced garlic clove and the grated lemon peel. Sprinkle with S&P to taste and sauté until crisp-tender (about 3 minutes). Cover to keep warm. Optionally of course you can oven roast the asparagus (see my blog for a full guide to oven roasting various veggies). THIRD:Make the couscous and your 12 inch heavy skillet of some kind is the one you will be needing here. Add 1 3/4 C. vegetable broth, increase heat and bring to a boil. Reduce heat immediately to a medium-low, cover, and simmer until the liquid is absorbed and the couscous is tender (about 10 minutes). Watch to see that more broth might not be needed and if so add tiny bits (by tablespoons) until the pasta is done. 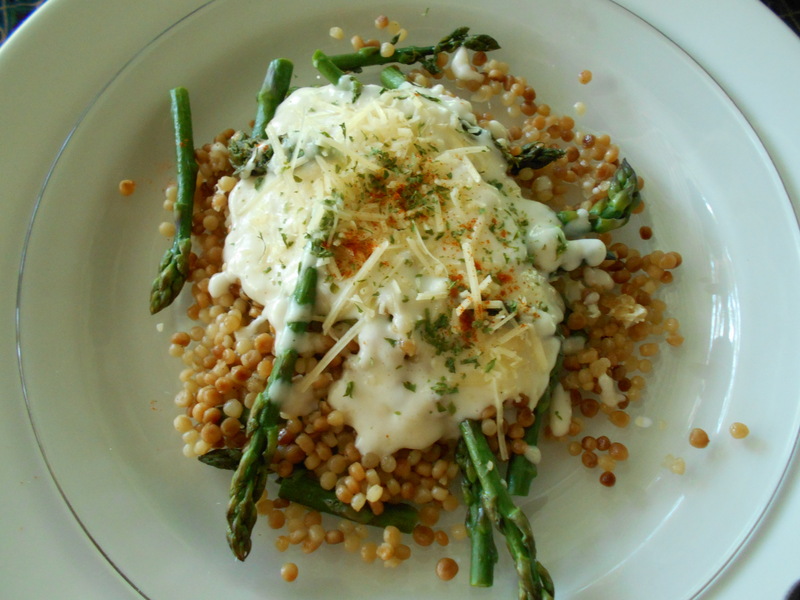 When done, turn heat to very low and add and toss the asparagus into the couscous. Make 4 large indentations for the duck eggs. Break the eggs in your indentations and still over low heat, place the cover on the skillet and let the eggs cook (about 5 minutes—here in the mountains). They should be ready when the whites have congealed. At that point, take the skillet off the heat and sprinkle it all with the Parmesan ( and chives if you wish) and of course, a nice sprinkling of that lovely paprika. SO__NOW______Bon Appétit (French) et Mange(Italian) So there you go, a bit of multilingual whatever and what more could you expect from a Swiss woman?